My friend Greg spent a good part of the fall helping to build my collection of New York Mets yearbooks and programs. And inside one of the early 60s programs he found for me, I discovered this letter from an unidentified “Met Fan” that I wanted to share. It’s easy for those of us who only heard tales of the “lovable losers” of the Mets’ early days to believe that baseball fans responded differently to their team in a different era. 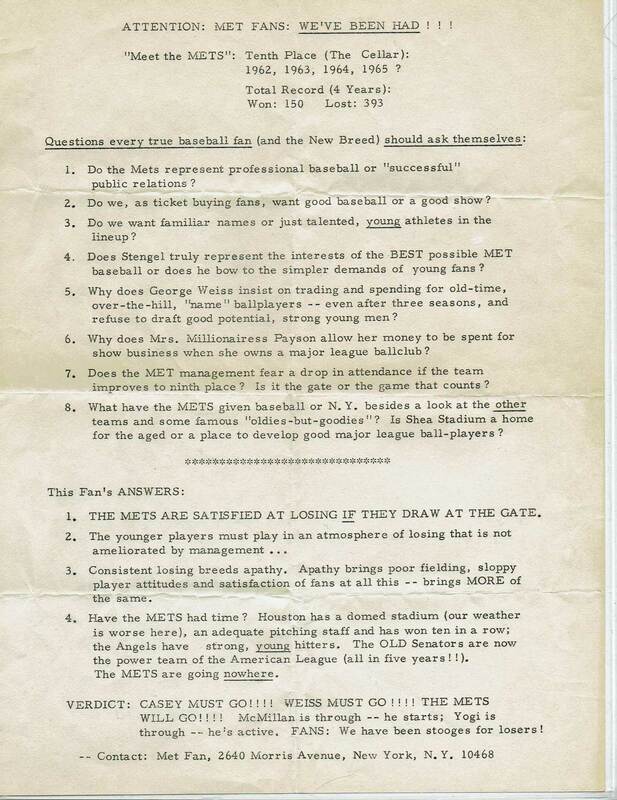 But this letter certainly suggests that there was at least a segment of Mets fans in early 1965 that weren’t too different from us now. CASEY MUST GO!!!! WEISS MUST GO!!!! THE METS WILL GO!!!! [shortstop Roy] McMillan is through — he starts; Yogi [Berra] is through — he’s active. FANS: We have been stooges for losers! Casey Stengel did not finish the 1965 season, forced out of the dugout after breaking his hip. Weiss remained as the Mets’ president and general manager for one more year… long enough to pass on future Hall of Famer Reggie Jackson in favor of catcher Steve Chilcott in the 1966 amateur draft. Roy McMillan had his best year with the Mets in 1965, but a .242 batting average likely did little to appease critics. And while I’m unclear on exactly how long Yogi Berra was on the Mets’ active roster, his final MLB game appearance was on May 9, 1965. Grass roots B.S. detector…I love it! Thanks for sharing that, that’s really fascinating! “The more things change”, right? While I understand his “When do we stop sucking?” frustration, he shouldn’t have been comparing the Mets to a 65-year-old franchise (the “Old Senators”) with the argument that they built a 102-win team “in five years”. True, that’s how long the Twins were in Minnesota, but Harmon Killebrew, Zoilo Versalles, and Jim Kaat (just to name a couple) were all getting paychecks signed by Calvin Griffith well before the Mets existed. The flyer’s author either didn’t know what he was talking about, or he *did* know but would rather compare the Mets to the AL Champion Twins instead of properly comparing them to the 92-loss “New” Senators. Yogi was on the active roster from the 27th of April until the 17th of May in 1965. They’d brought him over as a Coach, really, but joked about a battery of Yogi and Warren Spahn throughout spring training. We had plenty of catchers and plenty of outfielders and, thanks to the bonus rules at the time, a full 40 man roster, so it was basically a gag because nobody really foresaw a situation where Yogi would be activated–certainly not at the cost of a promising kid. When Kevin Collins was injured prior to his anticipated debut on April 25th, they put him on the DL and activated Yogi. What the heck, they weren’t going anywhere anyway. Yogi quickly discovered that his knees couldn’t handle catching anymore and begged out. He never caught Spahn, but caught Al Jackson twice (one win, one loss). He announced his re-retirement on May 12th, the day after the Mets acquired Chuck Hiller from the Giants. Hiller took Yogi’s spot on the roster on the 17th (played his first game for the Mets on the 18th). We did lose outfielder Bob Nash out of all this. We’d been hiding him on the DL. To put Collins on the DL, we had to pass Nash through waivers. Didn’t work. The Phils snatched him up. As it turns out, Nash never fully recovered anyway. I never realized we had whiners that far back; I thought that was a recent phenomenon. Heck, we make it to the Series and these babies still aren’t happy. I wish they’d all just go root for the Cubs or something. I’ve had my fill of these so-called fans whose mission in life is to complain, no matter what. Thanks for clarifying the history there.